Historically, the absence of women and the presence of damaging gender stereotypes in peace negotiations has led to the creation of reintegration programs that ignore the needs, capacities, and realities of women (see: Mackenzie, 2012; Coulter, 2006). The exclusion of women from peace processes leads to women's rights, the role of women in war and peace, and sexualised violence being underestimated, and often neglected - by many governments and armed groups alike. This article focuses on the role of women in the negotiations leading to Colombia’s peace agreement, recognized as history’s most inclusive peace deal internationally. It highlights the importance of applying a gender perspective in peace negotiations and reiterates the imperative of bringing all voices to the table. Moreover, highlighting the role of Sweden and Norway in facilitating the inclusion of a gender perspective in Colombia’s peace process, it draws attention to the importance of international support in the form of other countries’ foreign policy in ensuring women’s voices are heard and prioritized in negotiations and the implementation of peace agreements. When negotiations began for the 2016 Colombian peace agreement, only one woman, Victoria Sandino, an ex-combatant of the Fuerzas Armadas Revolucionarias de Colombia (FARC) army and current congresswoman, was sitting at the table. “At that time there were twelve women in a delegation of thirty guerrilla members”. Sandino describes how she became involved in the process and opened the door for more women, “I have experience in social communication and journalism, so I was asked to advise on communication strategies. I demanded the FARC secretariat to make Farian women more visible in the process. They assigned me a position at the negotiating table, which made it possible for me to create a window so women could have more visibility”. She adds: “another key factor was that the Colombian women’s movement were also demanding women’s participation in the dialogues at Havana". One feminist actor that has vocally advocated for women’s substantive participation in the peace process is Sisma Mujer, a Colombian feminist organization credited with significantly contributing to the inclusiveness of the peace agreement. Claudía Mejía, Sisma’s Director explains how civil society has influenced the process: "the Colombian women's movement is united in the goal of peace [and] was one [of the] most prepared for the arrival of peace. Our greatest demand was that peace had to be achieved through negotiations”. Mejía further describes how, in many ways, the Colombian feminist movement had been postponed during the years of armed conflict, “to focus on the enforceability of the state of public policies and decisions in favour of women victims of the armed conflict. So, when the negotiation process began, we were ready and prepared with historical practice, a theoretical framework, and the support of the collective action.” According to Mejíá, the international community played an important role too: “There is another element that needs to be considered, which is the international community – the peace dialogues came at a time when the international community had raised the standard of gender equality". One of the standards and tools referenced by Mejía that links gender equality with international conflict is the United Nations Security Council (UN) Landmark Resolution (S/RES/1325) on Women, Peace, and Security, adopted in 2000. This resolution was a critical tool for the women's movement in Colombia. It promotes actions in four specific areas: increasing the participation of women in peace processes and decision-making; training for the maintenance of peace from a gender perspective; protection of women in armed conflicts and post-conflict situations; and the transversal introduction of gender in the UN information systems and program implementation. After more than fifteen years, there is no doubt Resolution 1325 has helped improve the participation of women as active agents in the promotion of peace and security – including in Colombia. Armed with Resolution 1325, Sandino, Mejíá, and others started to pressure the government and the FARC to widen the inclusion of women in the conversation. The first success was two more women, Nigeria Rentería and María Paulina Riveros, were called to the table to join Sandino as negotiators. Soon after, the Subcommittee on Gender was established. Describing the aim and purpose of the Subcommittee, María Paulina Riveros, Delegate for the Government, stated back then: "The work of [the] Subcommittee will start from the complexity of a gender approach, and will overcome traditional or cultural value-based models. Only women, with diverse experiences, all of them, from their particular and superimposed conditions, will be the origin and the end of our task". Opponents of the peace process mobilize religious groups to vote against the agreement. In the end, their efforts paid off. In constructing the peace agreement, the Colombian government acknowledged the importance of resolving gender asymmetries and inequities; recognizing and guaranteeing the rights of women in rural areas; improving political participation of women; and addressing the rights of the victims at the end of the armed conflict. It also recognized the imperative of inclusive and non-discriminatory language in the Agreement. However, the results of the public vote on October 2, 2016 rejecting the peace agreement between the government and the FARC, presented a critical obstacle, which directly affected the participation of women and the incorporation of gender perspectives in the peace process and wider public discussions. Several sectors rejected the peace agreement arguing the gendered approach of the Agreement was an "ideology" that de-stabilized family values, pushed for the transgression of traditional gender roles, and promoted homosexuality. “The weight of gender in the arguments that led people to vote 'no' in the plebiscite surprised us all, including the government, especially what emerged from broad religious sectors", says Claudia Méjía. "That demonstrated we had not been talking to a substantive sector of society. That is why I always promote the necessity of 'improbable dialogues': either we speak all sectors, or we will continue to be surprised by people’s response. Convincing religious people, the peace agreement is against the Bible was the most perverse thing these people did – they positioned the Bible against peace, to the possibility of stopping killing one another". However, at the negotiating table, there was no debate. The gender perspective should and would be central in the final agreement. Mejía says: "after the plebiscite, the gender approach still remained in the Agreement because standards of equality are indisputably in the Constitution. If a victim of sexualised violence is a transgender woman, then will you not [help] her because she is trans[gender]? You can think what you want about that reality, but the Constitution says we are all equal, so all people have to be [helped]". After the vote, Laura Cardozo, Gender Advisor for the FARC team, reported the team focused on packaging the agreement differently by making changes in the language: "We had to make changes in the language so we could agree with both parties. We had to address the complaints, but we had to be sure the political focus on women and the LGBTI population was preserved". As a result, ‘gender’ was largely replaced by ‘women’. As Gender Advisor for the FARC and personal consultant to Victoria Sandino, Laura Cardozo came to the table sponsored by the Norwegian government. In fact, the government of Norway sponsored three gender experts to assist with the negotiations: Magalys Arocha Domínguez, from Cuba, Hilde Salvesen, from Norway and Camila Riesefeld from Sweden. These experts facilitated several meetings, including a meeting in 2015 with women from FARC, and other ex-guerrillas from all over the world, including El Salvador. “The Salvadorans told us after the peace process they planned a return to civil life in mixed and impartial terms, but as they became a political party, the ex-guerrilla women were left behind. They began to take on the traditional gender roles while the men were the candidates for political office”, Cardoza reports. “Twenty years after the signing of the El Salvador agreement, the women ex-combatants demand the party must have gender secretariats and demand joint policies". The support by the international community did not stop there. As a guarantor of the implementation of the agreement, the Government of Sweden contributed over SEK 67 million, equivalent to 6.6 million Euros, during the peace process. The joint Swedish-Norwegian Fund for Support to the Colombian Civil Society (FOS) was created to support Colombian organizations on projects that promote peace, strengthen the work of victim reparation, defend human rights, and strengthen of democracy within the consolidation of peace. Juanita Millán, the only woman from the military who participated in the negotiation, and the Monitoring and Verification Mechanism, believes: "the role of the governments of Norway and Sweden were key to the strengthening technical capacities in gender matters. It was possible to invite many experts who advised the Gender Subcommittee, and also supported social processes to strengthen the capacities of women's collectives. For example, financing of the Women's Summit Cumbre de Mujeres por la Paz, an event that brought together rural women, victims, displaced women, and feminist actors, amongst others, to start advocating the peace process". For Laura Cardozo and Victoria Sandino, the support of countries such as Sweden and Norway were a success in the provision of technical support and training for Farian women, as well as facilitating meetings with other former women guerrillas from other countries, to learn from their experiences during peace processes. It is necessary countries such as Sweden, who are guarantors of the implementation of the Agreement, demand a gender perspective is maintained at all stages. This includes ensuring state institutions maintain this perspective, especially to guarantee women victims of the conflict receive reparations, non-repetition of human rights violations, and access to land. 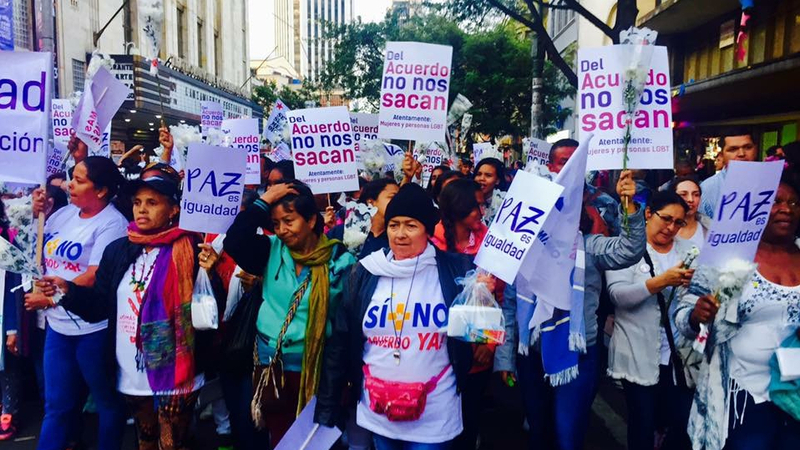 For the women's movement in Colombia, international support has been key to recognizing the manifold violence women experience in the midst of conflict and the importance of a gender perspective for a stable and lasting peace. What role do women play in the implementation of the agreement to achieve lasting peace? Speaking to her experience sitting on the Gender Subcommittee, Juanita Millán believes being a woman in the military gave her a different perspective: "Yes, it changes the perspective because gender is not visible to them [the men]. If we had not been next to them, the gender perspective would not have entered the Agreement. Because the priorities are different, for example, for me it was a priority to include gender violence as a form of violation of the ceasefire, men did not see this as a priority". Women are also the first to be affected by changes in power dynamics during, and after, conflict. According to Claudia Mejía, the rise in attacks against women human rights defenders is frightening. In the year 2017, murders in general increased by 30%, and the assassinations of women increased by 70%. Analyzing this increase in violence against women, Sisma Mujer, has found: “one of the powerful and structural reasons behind this violence is the repeated failure of the war on drugs in Colombia. This failure results in more mortalities, and prosecutions and imprisonment, but will not achieve the eradication of illegal drug trafficking”. There is also a rise in acts of violence against women when women activists begin to fight back against the system. The women's movement has been tracking violence against women long before the peace negotiations began. In 2008 the Constitutional Court issued Auto 092, a law that includes the vindication of the movement of women victims and equips the feminist movement to propose jurisprudence. However, as women began to utilize Auto 092, the murders of women human rights defenders increased rapidly between 2009 and 2010. In response, the women’s movement established gender sensitive models for violence prevention as a key part of the agenda for the women's movement. In Mejía’s words: "[…]the most substantial component of this program is prevention. But, how are these threats prevented? The answer lies in strengthening the leadership of women. If you enhance the participation of women in decision-making scenarios in social and community processes, attacks on [women] human rights defenders diminish for a simple reason: the stronger and more visible women are, the more difficult it will be to attack them”. Now, two years since the signing of the Peace Agreement, many things have changed in Colombia. President Santos' Government has been succeeded by a government of ultra-right idealists that came to the presidency promising to bring an end the Peace Agreement. Moreover, there has been slow to no progress in the implementation of the Agreement. Reports from institutes like the GPaz group, a women's board established to monitor the implementation of the agreement, claim the creation of commitments focused on gender do not exceed 20%, and highlight the main obstacles include: a lack of budget for the implementation, little technical expertise and training of government officials, and vast ignorance of rural contexts. Congresswoman Victoria Sandino reiterates this, stating: "the land fund decree says women should be prioritized but it does not say how to achieve this prioritization, that's why we are asking for a census of the rural population. Another frustration is everything related to sexual and gender differences has practically disappeared throughout implementation". Laura Cardozo also points out there are other obstacles that were unpredictable: "the women of the FARC are a new population for us. Everyone thought it was great there was a baby boom in the FARC after the signing of the Agreement, but nobody thinks about what that means, the problems of economic and food sustainability of expenses, food, diapers, and clothes. It was not included in the budget for the money of the reincorporation, nor was it contemplated in the medical pension". Commenting on some of the positive aspects of the implementation, Juanita Millán remarks: [T]he reincorporation policy launched in July 2018 has a fairly broad and substantial gender focus. The advances in the implementation of gender are a result of the active participation of women's groups in the spaces to ensure the ceasefire, the implementation of the construction of the reincorporation policy, and the gender technical committee”. Although the implementation of the Peace Agreement continues with slow progress, the women's movement does not lose hope. The Agreement laid out a new route for the country, with a focus on improving the lives of women. Going forward, the priority of the women's movement in Colombia is to defend the agreement. Only by maintaining the pact, peace can be achieved in Colombia, and only with the end of the conflict will women have the minimum conditions to live a life free of violence.